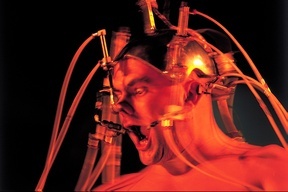 Interactive mechatronic performance presented for the first time in 1994. A body robot, in the shape of a pneumatic exoskeleton, enables the spectator to control the performer's body using a mouse. The Epizoo performance enables the spectator to control Marcel.lÌ's body by means of a mechatronic system. This system comprises a body robot, which is an exoskeleton worn by the performer, a computer, a mechanical body control device, a vertical projection screen, two vertical lighting rigs and sound equipment. The orthopaedic robot mechanism is held to the body by two metal moulds, a belt and a helmet, into which the pneumatic mechanisms are fitted. 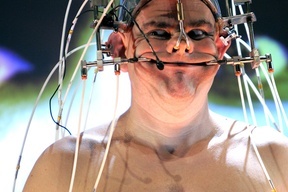 These mechanisms can move Marcel.lÌ's nose, buttocks, pectorals, mouth and ears while the artist remains standing upright on a rotating circular platform during the performance. The pneumatic devices are in turn connected to a system of computer controlled electro valves and relays. An exclusive application with an interface similar to a videogame is run by the computer. Its eleven interactive scenes include several computer generated animated sequences that recreate the figure of the artist and indicate the position and movement of the mechanisms. In this way the user can control the lighting, images and sound as well as the artist's body by using the mouse. In the art world, Epizoo is an early example of the application of computer technology to the human body. This performance is probably the first to feature a remote control device enabling the spectator to control onstage elements including the artist's body. Epizoo has aroused great interest since its opening and to date it has been performed in more than fifty cities in Europe, America and Asia. Produced by Marcel.lí Antúnez Roca, Sergi Jordá, Loma Productions (Barcelona) and the Festival SIGMA 1995, Bordeaux (France).